Trekking in the Karakoram & Hindukush by the intrepid husband-and-wife team of John Mock and Kimberley O'Neil is the definitive guidebook to the mountains of northern Pakistan (Lonely Planet Publications, 2nd ed. January 2002). Afghanistan (Lonely Planet Publications, 1st ed. August 2007). Pakistan & Karakoram Highway (Lonely Planet Publications, 7th ed. May 2008). Paddling the Frontier - Guide to Pakistan's Whitewater by Wickliffe W. Walker is the first and only river guide for Pakistan. Hiking Around Islamabad by Hans Van Hoeflaken is a detailed and thorough guide to one-day to three-day long hikes in the Margalla Hills outside of Islamabad. Trekking in Tajikistan is by Jan Bakker. After You, Marco Polo by Jean Bowie Shor is about this American and her husband who stumble into Hunzas Misgar Valley from Afghanistan's Wakhan Corridor. Among the Kara-Koram Glaciers in 1925 by Jenny Visser-Hooft describes one of the earliest crossings of the Khunjerab Pass and the first account of crossing the Chafchingol Pass (from north to south) into the Ghuzherav Valley and the Mai Dur Pass to Shimshal village. Beyond the High Himalayas by William O. Douglas is a resource for the whole Himalaya and travels through NWFP, Gilgit, and Hunza. Between the Oxus & the Indus by Reginald Charles Francis Schomberg chronicles travels to Gilgit, Yasin, and Hunza by this acidic British officer who found the landscapes nobler than the people. Beyond the Northwest Frontier: Hindukush & Karakoram by Maureen Lines has a special focus on the Kalash and current environmental issues. The Call of The Snowy Hispar by F.B. & W.H. Workman recounts the remarkable Fanny and her husband's visit to Nagyr and the Hispar Glacier. Desert, Marsh, and Mountain: The World of a Nomad by Wilfred Thesiger recounts travels to Chitral, Broghil, Ishkomen, and Swat, including crossing the Karambar An and Chilinji An. The Golden Peak: Travels in Northern Pakistan by Kathleen Jamie is an insightful book by a poet with an eye for the ironies of life for women, Muslims and travellers. The innocence of the first-time visitor has not been edited out. Included are glimpses of private lives that male visitors will never see. Among Muslims: Everyday Life on the Frontiers of Pakistan by Kathleen Jamie, originally published as The Golden Peak with an extended epilogue, recounts her visit to northern Pakistan post-September 11, 2001. The Heart of a Continent by Francis E. Younghusband relates classic journeys of a British colonial officer, including crossing the Muztagh Pass. The Himalayan Letters of Gypsy Davy and Lady Ba by Robert & Katherine Barrett is hard to find, but a fine read from a bygone era of romantic, idyllic travels through the Karakoram. In the Ice World of Himalaya Fanny Bullock & William Hunter Workman is about one of the first treks up the Biafo to Snow Lake, which Shipton later termed "Fannys Folly". Innermost Asia (Vol. I-V) by Sir Aurel Stein, a Hungarian-English archaeologist who focused on Central Asian sites between 1900 and the 1940s, recounts travels through Swat, Darel, Ghizar, Yasin, Darkot An, Karambar An, Chilinji An, and Chapursan Valley going to and from Taskurgan, Kashgar, and the Tarim Basin. his partisans would be wiser to cure his faults than advertise his virtues." Karakoram-Himalaya, Sommets de 7000 metres is by A. Roch. Karakoram: Mountains of Pakistan by Shiro Shirahata has the finest photos of the great peaks. The Last Nomad by Wilfred Thesiger has one of the few accounts of crossing the Chilinji An, also Broghil, Punji Pass and Kachakani An. The Lion River by Jean Fairley is a detailed and elegant book about the Indus River and the people who live along it. The Roof of the World by Mohamed Amin et al. has large format color photos of the Karakoram, Hindukush and Pamir. A Short Walk in the Hindu Kush by Eric Newby is a delightful, humorous tale of an ill-advised, ill-planned, and ill-equipped trek. Sisters on the Bridge of Fire: Journeys in the Crucible of High Asia by Debra Denker, who has travelled solo through Baltistan, Hunza and Chitral, and share the lives of local women. This My Voyage is by Thomas George Longstaff, a turn-of-the-twentieth century renowned explorer in Gilgit and Baltistan. Travels in Kashmir, Ladak, Iskardo is by Godfrey Vigne, who in 1835 was the first Westerner to visit these parts. Two Summers in the Ice-Wilds of Eastern Karakoram by F.B. & W.H. Workman describes their exploration of glaciers in Baltistan, including the Kondus, Bilaphond and Siachen Glaciers. 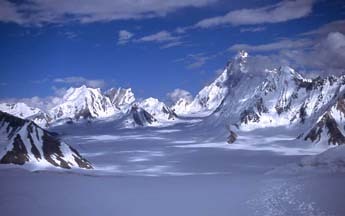 Unknown Karakoram by R.C.F. Schomberg recounts exploration of the area north of the main Karakoram, including Shimshal. Where the Indus is Young by Dervla Murphy is the redoubtable account of a winter in Baltistan, travelling on foot and horseback with her six-year-old daughter. Where Three Empires Meet by E.F. Knight are travels of a Victorian journalist in Kashmir, Ladakh and the Northern Areas, including a thrilling, but colonial, version of the 1891 invasion of Hunza. Chitral, the Story of a Minor Siege by Sir George Robertson is a classic colonial adventure by the then Political Agent for Chitral - heroic defenders of a remote outpost besieged by wild tribes, and nick-of-time relief against major physical odds. Ghost Wars: The Secret History of the CIA, Afghanistan and Bin Laden, from the Soviet Invasion to September 10, 2001 by Steve Coll, a Pulitzer Prize-winning journalist and former South Asia bureau chief and managing editor of The Washington Post, is an impeccably researched and well-written account. The Gilgit Game: The Explorers of the Western Himalayas 1865-95 by John Keay is a very readable account of the explorers and oddballs who played in the `Great Game', the imperial rivalry between Britain and Russia across the Pamirs, Hindukush and Karakoram in the late nineteenth century. The Great Game: On Secret Service in High Asia by Peter Hopkirk is a definitive, well written account of the Anglo-Russian rivalry in Central Asia. The Great Game: The Struggle for Empire in Central Asia by Peter Hopkirk. High Asia by Jill Neate gives a comprehensive illustrated history of the 7000-metre peaks. The Kirghiz and Wakhi of Afghanistan: Adaptation to Closed Frontiers and War by Nazif Shahrani. The Making of a Frontier: Five Year's Experience and Adventures in Gilgit, Hunza, Nagar, Chitral and the Eastern Hindukush is by Algernon Durand, the British officer who was in charge of establishing the Empire's border. The Pundits: British Exploration of Tibet and Central Asia by Derek Waller is an account of the heroic but unsung journeys of Indian scholars and soothsayers trained by the British to be undercover surveyors and spies across the Hindukush and Karakoram. A Record of Buddhistic Kingdoms by Fa-Hsien is the Buddhist monk's own dry account of his 5th-century pilgrimage through Xinjiang and the Karakoram, down the Indus to Gandhara and on to India. Excellent and much livelier descriptions of this and the later journey of another pilgrim, Hsuan Tsang, are in The Great Chinese Travelers , edited by Jeannette Mirsky. Sir Aurel Stein: Archaeological Explorer by Jeannette Mirsky portrays the life of this great explorer. When Men & Mountains Meet: Explorers of the Western Himalaya 1820-1875 by John Keay has gripping and often hilarious stories of the Europeans who first penetrated the western Himalaya in the early 1800s. Check out the photo of George Hayward, who lies buried in the Gilgit cemetery. First In: An Insider's Account of How the CIA Spearheaded the War on Terror in Afghanistan by Gary Schroen. Taliban: Miltant Islam, Oil, and Fundmentalism in Central Asia by Ahmed Rashid is required reading to understand how Afghanistan affects the entire region. Bolor and Dardistan by Karl Jettmar is a learned exposition of the ancient history of Gilgit, Hunza, and Baltistan by the dean of northern Pakistan scholars. Breaking the Curfew: A Political Journey Through Pakistan by Emma Duncan is a well-researched, thoughtful look at power and politics; recommended as an introduction to behind the scenes Pakistan. "Challenge and Response in the Karakoram" by Hermann Kreutzmann is in Mountain Research & Development (1993 13:1). Kreutzmann's articles listed here present much of his untranslated German doctoral research on the cultural geography of Hunza. Daughter of Destiny by Benazir Bhutto is an autobiography of this former prime minister of Pakistan. Descent into Chaos: The United States and the Failure of Nation Building in Pakistan, Afghanistan, and Central Asia by Ahmed Rashid is essential reading on the crisis affecting Pakistan, Afghanistan, the U.S. and the world. Empires of the Indus by Alice Albinia is "a triumphant melding of travel and history into a compelling story of adventure and discovery." Hunza - Lost Kingdom of the Himalayas by John Clark portrays the good as well as the bad aspects of life in Hunza when the Mir's power was total, by an American who worked there in the 1950s. The Idea of Pakistan by Stephen Philip Cohen is a thorough, reliable and independent analysis of how Pakistan came to be what it is today by a scholar and long time observer of the nation. India, Pakistan & The Kashmir Dispute: On Regional Conflict and Its Resolution by Robert G Wirsing is the best study of the seemingly unending Kashmir imbroglio. Kalash Solstice by Jean-Yves & Vivianne Lièvre Loude is a passionate and detailed study of the religious traditions of the non-Muslim Kalasha people of Chitral. "The Karakoram Highway: The Impact of Road Construction on Mountain Societies" by Hermann Kreutzmann is in Modern Asian Studies (1991, Vol. 25, 4). "Kashgar to Islamabad: The Impact of the Karakoram Highway on Mountain Societyquot; by Nigel J.R. Allan, in the Scottish Geographical Magazine, July 1989 is an interesting academic account of how the KKH has irrevocably changed the Northern Areas. Language Hunting in the Karakoram by Edith O. Lorimer is a readable, but romanticized account of Hunza by the wife of the British Resident and scholar. "Oases of the Karakoram" by Hermann Kreutzmann is in Human Impact on Mountains , Nigel J.R. Allan & Knapp (ed). Pakistan: Between Mosque And Military by Husain Haqqani, Pakistan's recent ambassador to the U.S.
Rockcarving and Inscriptions in the Northern Areas of Pakistan by Karl Jettmar is a handy guide to the area's numerous petroglyphs. Tribes of the Hindoo Kush by John Biddulph is a reprint of a nineteenth century classic by the first Political Agent in Gilgit. The Veil and The Male Elite by Fatima Mernissi presents "a feminist interpretation of women's rights in Islam." Waiting for Allah by Christina Lamb is a bleak tale of the rise and fall of Benazir Bhutto and the country's depressing failure to seize the chance for democracy. Pakistani politics come out looking terminally bankrupt. Words For My Brother by John Staley discusses the culture, politics, religious traditions and recent history of pre-Karakoram-Highway Chitral, Kohistan, Gilgit and Hunza. Staley and his wife studied and travelled here in the 1960s. This scholarly but affectionate book is a favourite on the Northern Areas. Mammals of Afghanistan by Khushal Habibi. Birds of the Indus by Mubashir Hasan. The Birds of Pakistan (Vol I. & II.) by T.J. Roberts is a standard reference. The Butterflies of Pakistan by T.J. Roberts. Concise Flowers of the Himalaya by Oleg Polunin and Adam Stainton is an inexpensive and easy-to-carry field guide. The text is abbreviated and descriptions are limited to the species illustrated. Continents in Collision by Keith Miller discusses the geology underlying the relentless grind of Nanga Parbat against Rakaposhi. Field Guide to Indian Mammals by Vivek Menon. Flowers of the Himalaya by Oleg Polunin and Adam Stainton is the standard reference with more than 690 color illustrations, 315 B&W drawings and 1500 entries. Islamabad Birds by Geoff Ward is useful for walks in the Margalla Hills. The Mammals of Pakistan by T.J. Roberts is a large and hard-to-find standard reference that serves as a reminder of how quickly large mammals disappear when modern roads and weapons make their appearance. Pocket Guide to Birds of the Indian Subcontient by Richard Grimett, Carol Inskipp, Tim, Inskipp. Stones of Silence: Journeys in the Himalaya by George B Schaller has tedious, but somehow gripping accounts by the biologist who first photographed the snow leopard, of his research on this and other mammals in the Hindukush, Karakoram, and Himalaya. Wild Flowers of Pakistan by Yasin Nasir and Rubina Raif describes and illustrates over 650 flowering plants. Abode of Snow by Kenneth Mason gives "a history of Himalayan exploration and mountaineering from earliest times to the ascent of Everest." All 14 Eight-Thousanders by Reinhold Messner recounts his ascents without oxygen and many of them solo. This is probably the greatest mountaineering feat of all time. Climbing and Exploration in the Karakoram-Himalayas by William M Conway describes the first expedition to the Baltoro Glacier; a classic which is difficult to find. Elusive Summits: Four Expeditions in the Karakoram is by Victor Saunders, leading proponent of the new generation of alpine-style exploration. Freedom Climbers by award-winning author Bernadette McDonald highlights the "Golden Age of Polish Mountaineering" in the 1980s and 1990s, featuring Jerzy Kukuczka, Voytek Kurtyka and Wanda Rutkiewicz. The Hard Years by Joe Brown is an account of the first ascent of the Muztagh Tower. Himalayan Odyssey by Trevor Braham describes small expeditions to peaks in Chitral, Swat and Kaghan. In the Throne Room of the Mountain Gods by Galen Rowell recounts the American K2 expedition with the best history of Baltoro exploration and fine photographs. K2: Triumph and Tragedy by Jim Curran recounts the horrendous 1986 season, when K2 claimed thirteen lives. Karakoram and Western Himalaya by Fillipo de Filippe recounts the Duke of the Abruzzis 1909 Baltoro Glacier expedition, with Vittoria Sella's incredible photographs. The most sought after rare book on Himalayan exploration. Karakoram: The Ascent of Gasherbrum IV by Fosco Maraini is an excellent description of the Karakorams and of the upper Baltoro Glacier. Nanga Parbat - the Killer Mountain is by Karl M. Herrligkoffer who devoted much of his life to this mountain. Nanga Parbat Pilgrimage: The Lonely Challenge by Hermann Buhl is an account of the 1953 solo first ascent of Nanga Parbat. Rakaposhi by Mike Banks is an account of the first ascent of Rakaposhi. Storm & Sorrow in the High Pamirs by Robert W. Craig recounts in 1974 when 160 climbers from twelves countries converged on the Pamirs Mountain Range when no Americans and few Europeans had ever climbed in these mountains. Summits and Secrets by Kurt Diemberger gives accounts of Broad Peak, Chogolisa and Tirich Mir. Thin Air: Encounters in the Himalayas by Greg Child is a well-written, award-winning account of Karakoram alpine-style climbs. Tirich Mir: The Norwegian Himalaya Expedition by Aarne Naess et. al. is the story of the first ascent of Tirich Mir. 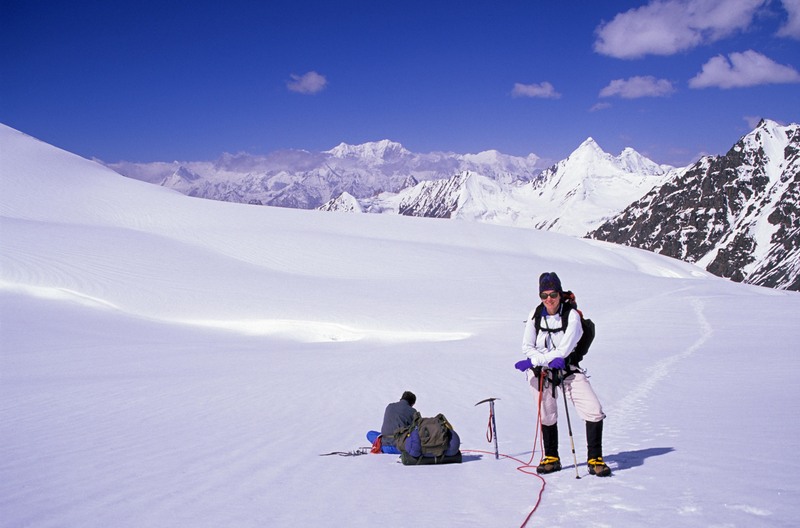 A Walk in the Sky by Nicholas Clinch is an account of the first ascent of Gasherbrum I. Where Four Worlds Meet: Hindu Kush, 1959 by Fosco Maraini is a well-written account of an expedition to Saraghrar in Chitral, with a visit to the Kalasha Valleys. Hindi, Urdu & Bengali Phrasebook (Lonely Planet Publications, 3rd ed. forthocming 2005) is a useful reference for vocabulary, grammar, pronunciation and phrases. Teach Yourself Urdu in Two Months by Aziz Rahman is available in major book shops in Pakistan. The Illustrated Guide to Glacier Travel & Crevasse Rescue by Andy Tyson and Mike Clelland contains material that anyone trekking on glaciers should know - don't step on a glacier without reading this book. High Altitude: Illness and Wellness by Charles Houston, who knows his subject. Hypothermia, Frostbite and Other Cold Injuries: Prevention, Recognition and Pre-Hospital Treatment by James A. Wilkerson, M.D. is essential if you are travelling across glaciers. You'd be well-advised to know how to prevent or treat these vicissitudes. International Travel Health Guide by Stuart R. Rose, M.D. is updated annually and contains easy-to-read information. Medicine: For Mountaineering & Other Wilderness Activities by James A. Wilkerson, M.D. is the "bible of mountaineering medicine" for the lay person. Medicine for the Outdoors: The Essential Guide to Emergency Medical Procedures and First Aid by Paul S. Auerbach, M.D. gives easy-to-understand, quality advice for all backcountry emergencies and ailments. Mountaineering Medicine and Backcountry Medical Guide by Fred T. Darvill, M.D. is a pocket-size handbook now in its 13th edition. Mountain Medicine: A Clinical Study of Cold and High Altitude by Michael Ward discusses cold and high altitude problems. Mountain Sickness: Prevention, Recognition, and Treatment by Peter H. Hackett, M.D. is an essential pocket-size handbook for anyone trekking above 4,000 meters. Mountaineering: The Freedom of the Hills by Steven Cox et al., published by the Mountaineers, Seattle, Washington, contains excellent information. Travellers Health: How to Stay Healthy Abroad by Richard Dawood, M.D. is comprehensive, easy to read, and authoritative, although it is too large to carry around. Where There is No Doctor: A Village Health Care Handbook by David Werner is a very detailed reference for the lay person, covering most diseases and injuries you might encounter and their treatment. A South Asia specific edition is available from the Voluntary Health Association of India in New Delhi.